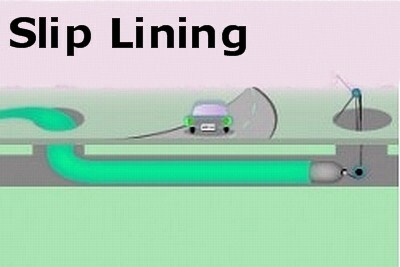 Slip lining, a method for pipe restoration, is the insertion of a smaller polyethylene pipe into an existing pipe line. This is a much cheaper and quicker way to improve a damaged or deteriorating pipe. Before slip lining can begin, the host pipe requires inspection to ensure the interior is both smooth and round. Once it is determined the slip lining process can be used, there are three methods to choose from: continuous, segmental, and spiral wound. Each of these methods require excavation by a remote-cutter to re-connect the laterals. With continuous slip lining the new pipe is connected to form a continuous segment, so it’s important that the insertion pit or manhole be able to handle the bending of a continuous pipe section. Segmental slip lining allows the job to be completed without rerouting the existing flow and involves and assembles the pipe segments at the access point. Finally, spiral wound slip lining is done through an access point or manhole, using interlocking edges to connect the segments, which is then inserted into the host pipe. Because the new pipe is smaller than the existing one, the excess space between the two pipes must be grouted in order to prevent leakage and to provide structural integrity.